The Sexton records indicate that Lurania died of small pox. 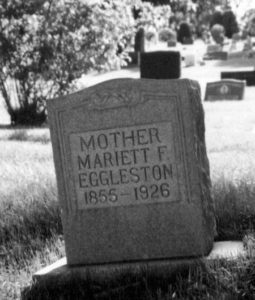 There was a smallpox epidemic in 1870 and one journal says that Mrs. Eggleston was the first to contract this disease and pass away. Two of her son Reuben’s children also died of smallpox that year. Afflicted people were quarantined at two locations: Farr’s Grove which was just north of the Cemetery on the other side of the river on land owned by the Farr family (Samuel’s daughter Mary married Enoch Farr, so this was his family’s land); and at Burch Creek (now South Ogden near my home) on land owned by the Stephen’s family (Orson’s first wife Constance Stephens‘ father John Stephens died of smallpox later that year). There are also “twins” buried in the family plot B-2-30-1W. I am not sure who these would be. 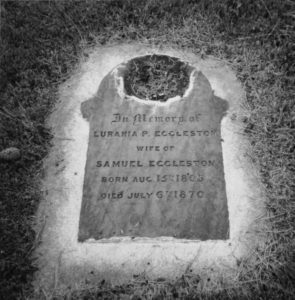 Samuel and Lurania’s son Reuben, his wife Emeline and several of their children are buried together A-1-27. Reuben began burying children in this plot soon after they arrived in Ogden. Daughter Ida May was born November 15, 1861 and died August 28, 1862. 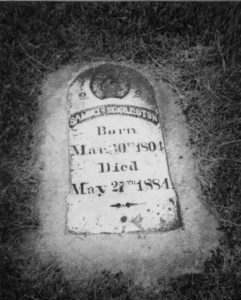 Son Charles Fredrick who had been born May 15, 1895 in Council Bluffs died here September 28, 1866. In 1870 they lost four year old Cora Gladys on July 26 and three year old May Julia August 6 to smallpox. Of their 12 children, only three survived both their parents. I did not have photos of any of the headstones for Reuben’s family, which was surprising since I had been there repeatedly taking photos. I made another trip recently and thoroughly searched the area where they should be without finding any stones. Find A Grave does not have any headstone photos either. Maybe there were never stones placed there, or somehow they were destroyed or sufficiently buried to not be visible. God in His wisdon has recalled. 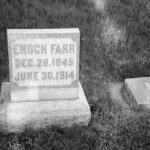 This entry was posted in Cemetery Tour, Historical Information, My Stories of Discovery and tagged Cemetery, Eggleston, graves, Utah. Bookmark the permalink. Thank you for recording what you learned as you researched these gravesites, Karen. It is good to have such experiences written down in case there are future questions. If only more people had written down more things in the past!! 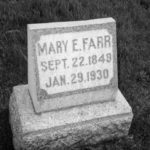 And thank you for linking the names in here to the findagrave records.